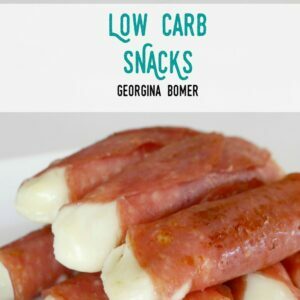 These “Pigs in Blankets” are low carb, gluten free, and keto-friendly – and perfect for your festive party! “Pigs in Blankets” in the UK (where I’m from!) 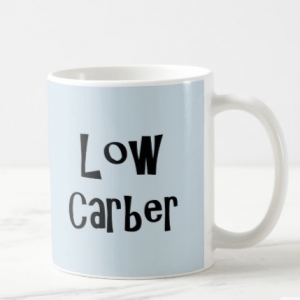 usually refers to small sausages wrapped in bacon – which of course are delicious! But here in the US, they are usually wrapped in dough. But that dough is high in carbs, and as I’ve been wanting to experiment with something called “FatHead Dough” for some time, I brought these two ideas together. 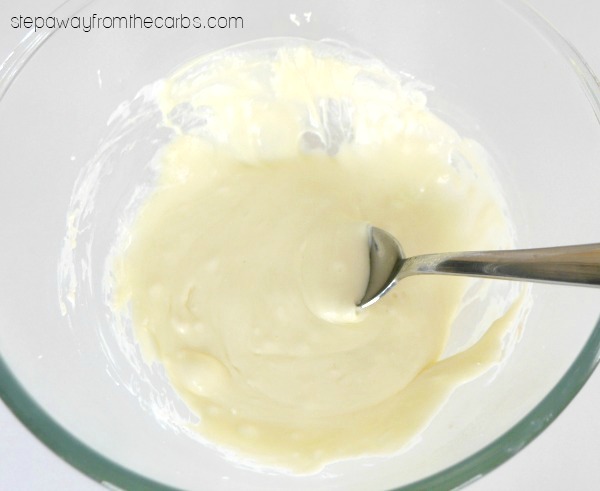 You can read all about this dough in my Ultimate Guide to FatHead Dough! 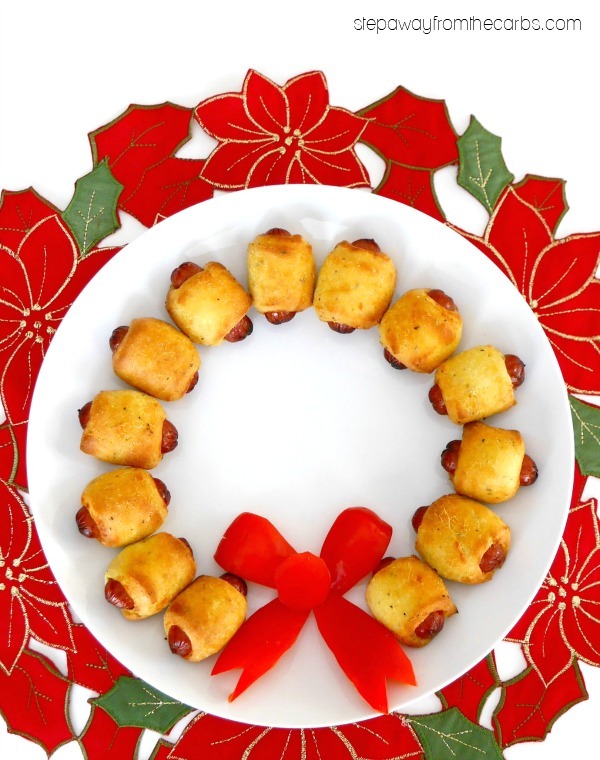 It was perfect for wrapping cocktail sausages, and making into a festive dish for entertaining! For the sausages I turned to the Klement’s brand. They actually make five kinds of cocktail smokie: regular, cheddar, bratwurst, Polish, and Italian! 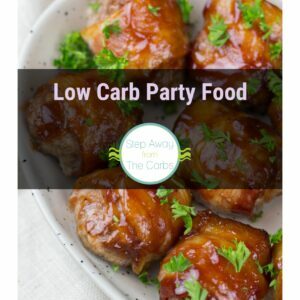 I used the regular ones which are a combination of pork and beef, and contain 2g net carbs for five links. Like all of the artisan products from Klement’s, they are great quality – which can sometimes to be hard to find with this type of sausage! To make the “blankets”, combine shredded mozzarella and cream cheese in a medium size microwaveable bowl. Microwave on high for one minute, stir, and then cook for another 30 seconds. The mixture should be smooth. Stir in a beaten egg, some almond flour and Italian seasoning. You will start to see a dough forming. 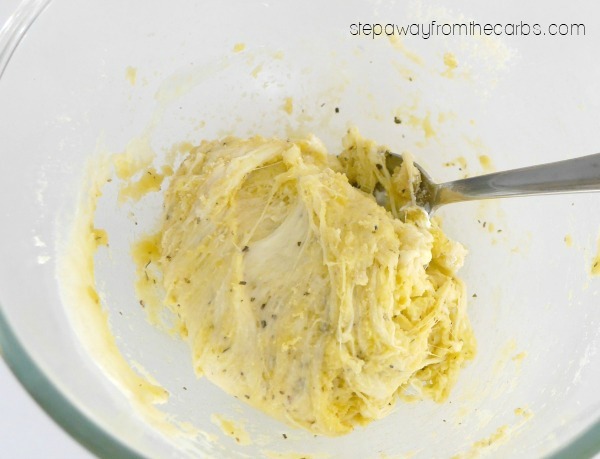 Allow the dough to cool slightly then knead the dough with your hands for a minute. Spread it out thinly on a chopping board and cut it into small rectangles. Wrap each cocktail smokie in a piece of dough and place seam-side down on a lined baking sheet. 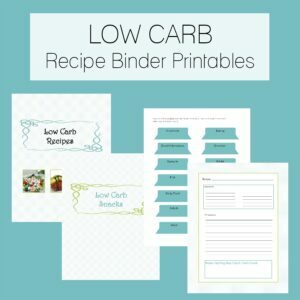 Bake in a preheated oven for 12-15 minutes until browned on top. If you’re serving this as a wreath as shown here, you could cut a “bow” for your wreath from red bell pepper. Use the top of the pepper for two curled parts at the top, then the straight sides of the pepper for the two ends of the ribbon and a circle for the center. 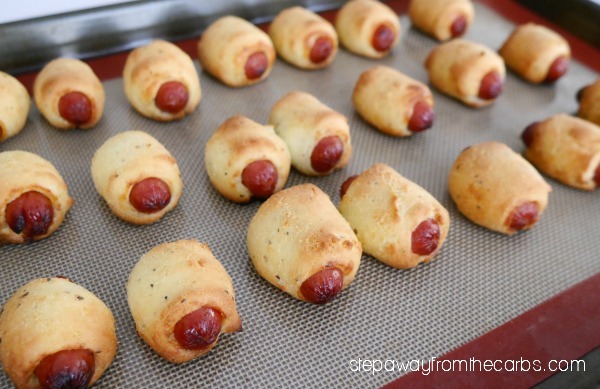 Serve these pigs in blankets as soon as you can – they are SO good straight out of the oven!!! 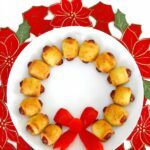 These "Pigs in Blankets" are low carb, gluten free, and keto-friendly - and perfect for your festive party! Put the mozzarella and cream cheese in a medium size microwaveable bowl and cook on full power for 1 minute. Stir and then cook for another 30 seconds. Stir in the beaten egg, almond flour, and Italian seasoning. Allow to cool slightly then knead the dough with your hands for a minute. Spread the dough thinly out onto a chopping board and cut it into small rectangles. Wrap each cocktail smokie in a piece of dough and place seam-side down on a lined baking sheet. 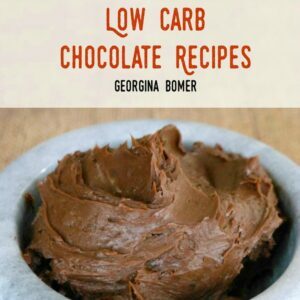 Bake for 12-15 minutes until browned on top. For the garnish, cut the red bell pepper into five pieces to make the "bow" of the wreath. 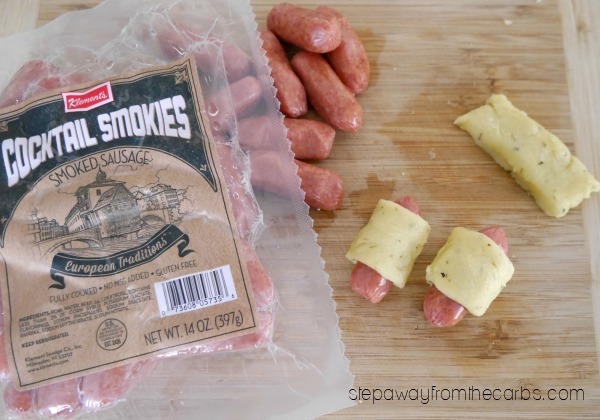 The dough stayed all sticky and I was not able to roll it out and cut into pieces to wrap around the little smokies. I just had to roll it in my hand and wrap around the smokies. The taste was pretty good but they were very time consuming to make. I believe the problem may be in the cheese – some contain more moisture than others. So you could try another brand or even grate your own?